A new race series for electric cars is in the works, and it will be unlike anything that’s come before. The FIA World Rallycross Championship plans to launch a companion electric-only series called Projekt E. Electric cars will race on the same tracks as current internal-combustion rallycross cars, meaning plenty of sideways action. It will be a very different kind of racing from the current dominant electric racing series — Formula E.
The establishment of Projekt E comes after a failed vote to introduce electric cars into the main World Rallycross Championship, reports Autosport. Organizers wanted that to happen in 2021, but the automakers involved in the series voted against the plan March 29. Instead, electric cars will run separately, with races held on the same dates as conventional World Rallycross races, on the same tracks. 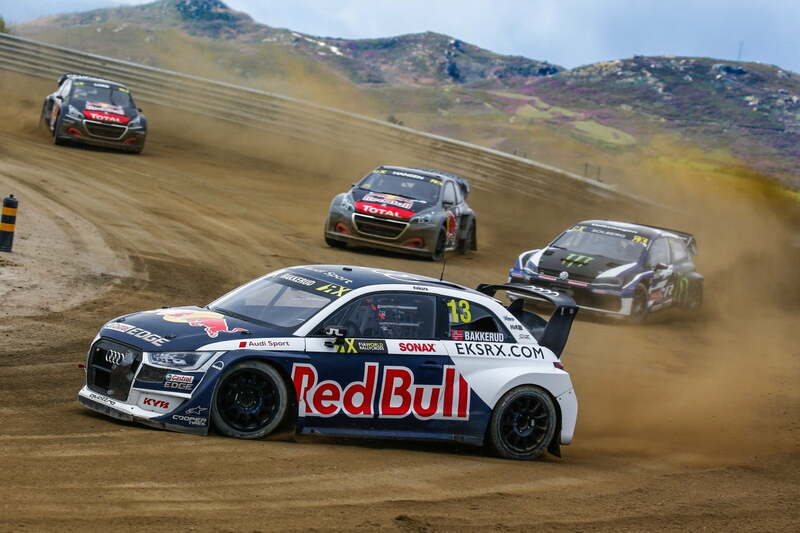 That means fans will be able to see electric cars and internal-combustion cars over the same weekend, a World Rallycross press release noted. Rallycross is the automotive equivalent of an extreme sport. Races are held on tight, twisty circuits that are half pavement, half dirt. Cars are loosely based on ordinary compacts, but feature all-wheel drive and turbocharged engines producing upward of 600 horsepower. The short duration of each race is perfectly suited to the age of social media-shortened attention spans. It also forces drivers to be more aggressive, which makes the racing more exciting. Projekt E will add a bit of variety to electric racing. The only other major electric racing series, Formula E, focuses on conventional circuit racing with purpose-built race cars. Formula E also has a companion series in which drivers race Jaguar I-Pace electric SUVs on the same circuits, as a kind of warmup act to the main event. The Electric GT Championship is attempting to launch a race series around the Tesla Model S, but may invite other manufacturers if comparable cars become available. The Volkswagen I.D. R conquered the Pikes Peak International Hill Climb in 2018, smashing a record previously held by gasoline cars, but that was a one-off affair. Formula E also plans to launch a new series, called Extreme E, for electric SUVs. It’s designed to take electric racing off-road and into more extreme environments. Tentatively scheduled to launch in 2020, Extreme E could hold its first race before Projekt E.